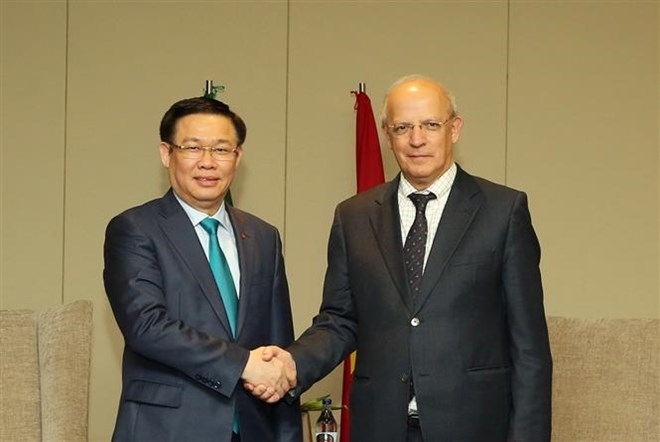 Portugal backs the early signing of the EU-Vietnam Free Trade Agreement (EVFTA), Portuguese Minister of Foreign Affairs Augusto Santos Silva told Deputy Prime Minister Vuong Dinh Hue during their meeting in Lisbon. At the meeting as part of Hue’s current visit to the European country, the two expressed their delight at the recent development of the two countries’ relations, following the visits to Portugal by Prime Minister Nguyen Tan Dung in June, 2015 and Deputy PM Pham Binh Minh in May last year. They agreed that Vietnam and Portugal should further bolster bilateral ties in economics, trade, investment, education and cultural exchange. The two governments need to facilitate enterprises from both sides to make inroads into each other’s markets and invest in the two nations’ areas of strength, Hue said. He asked Portugal to push for the early signing of the EVFTA which can act as a catalyst for the Vietnam-Portugal economic relations to grow further. The Portuguese FM spoke highly of Vietnam’s robust economic growth and affirmed his country’s support to the early signature of the EVFTA. The Portuguese government wishes and is ready to create favourable conditions for Vietnamese firms to do business in the country, he added. 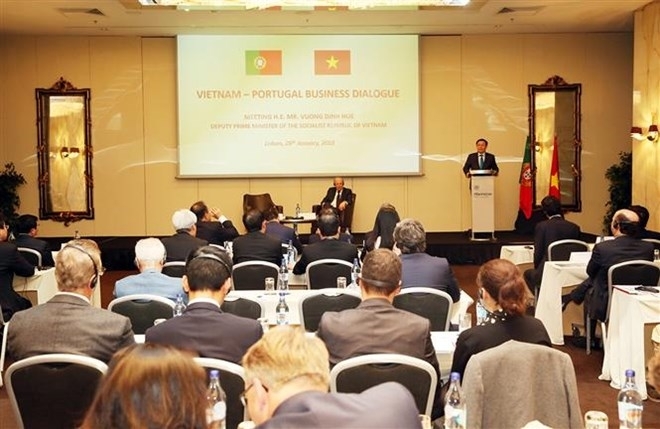 During the visit, Deputy PM Hue delivered a speech at the Vietnam - Portugal Business Dialogue which gathered about 50 leading firms from the both sides. 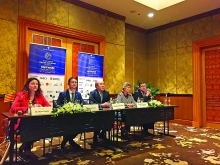 Vietnam’s political and socio-economic stability and its investment incentives are favourble business climate for foreign investors, including those from Portugal. In 2017, Vietnam achieved high economic growth of 6.8 percent, drew in more than 30 billion USD in foreign direct investment and post over 420 billion USD in foreign trade turnover, he said. He reiterated that the State and Party of Vietnam is consistently pursuing economic reforms and improving local legal systems for the economy to integrate deeper into the global economy. With the EVFTA and other new-generation FTAs soon coming into effect, he encouraged Portuguese companies to invest in the areas of manufacturing, hi-tech industry, infrastructure development, environment, agriculture-forestry-fisheries and food processing, renewable energy, information technology, pharmaceuticals, biology, construction, high-quality services, and finance-banking in Vietnam. Many Portuguese businesses voiced their interest in partnering with their Vietnamese peers in finance, export of farm products, pharmaceuticals and tourism and hoped to get better access to ASEAN markets via Vietnam. Hue, accompanied by Vietnam’s leading corporations like VNPT, Vietcombank, VinaCapital and CT Group, also met with local leading firms during his visit.